High Quality- 100% new, Very Comfortable to Wear. Plastic fiber , suitable for child ,adult . Â¡Â¤Applicable places: Cosplay game, Role play, Dance evening, Stage Costume,Halloween, Carnival, Theme Party, Fancy Dress Party etc. Delivery time is 10-20 days , welcome to order . 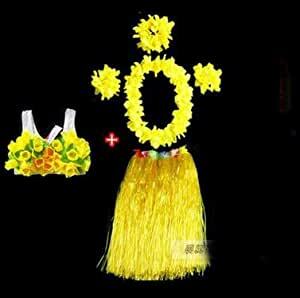 Â¡Â¾SpecificationÂ¡Â¿: grass skirt thick section, skirt length 80CM, 60cm, 40cm, 30cm.